Folk music fans are in for a treat if they head up to Marblehead tonight. The show at the Me & Thee Coffeehouse features Bill Staines, a warm, lefty troubadour whose songs Peter, Paul, and Mary, Makem and Clancy, Nanci Griffith, among many others. Splitting the bill will be Sally Rogers, a performer of traditional, contemporary and original ballads. 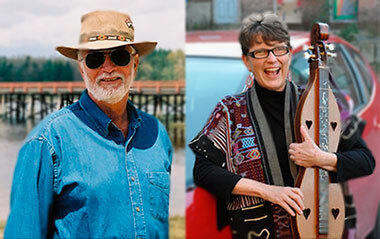 Bill Staines & Sally Rogers will perform tonight, April 4, 2014 at the Me & Thee Coffeehouse in Marblehead, Mass. Also, Marblehead native Amanda Maffei has written a beautiful song about the Boston Marathon and with the marathon just around the corner she is stopping by to perform it for the me&thee audience. Staines continues to perform more than 175 shows a year and drives close to 70,000 miles getting to them. He is one of the most durable and beloved singers on the folk music scene today. He has 26 recordings to his credit and has written over three hundred songs, many of which have been recorded by the likes of Peter, Paul, and Mary, Makem and Clancy, Nanci Griffith, Glen Yarborough, and Jerry Jeff Walker. His music is sung at campfires and folk music gatherings, in homes and churches, all around the country. Songs like “All God’s Critters,” “The Roseville Fair,” “Child of Mine,” and “River,” have become folk music classics. Sally Rogers is primarily an educator now but has had a long career as a performer. Throughout her concerts, she accompanies herself on guitar and Appalachian dulcimer, or performs without accompaniment in a voice that needs no further enhancement. Reviewers have described her voice in superlatives ranging from “remarkable” to “mesmerizing.” As one critic summarized, “it’s really next to impossible to do justice to a voice of that quality.” Much of the material Sally performs includes compositions of her own, many of which are considered classics of the folk and popular genre.